This weekend’s baking extravaganza included several batches of cookies and a few batches of cupcakes for a friend of a friend’s daughter’s birthday. Inside, these white almond cupcakes have a surprise: a raspberry buttercream filling, with an extra pop of pink. My first plan for these cupcakes involved raspberry jam filling, but it just didn’t seem right for a whimsical, rock star-themed girl’s party. Because I wanted a pink filling, I tossed together a version of raspberry buttercream that is much more filling-like than frosting-like. You could use a raspberry filling like the one in this lemon raspberry roulade, or even a pastry cream tinted pink, if you prefer. *To make sour milk, place 1 1/3 tablespoons vinegar in a glass measuring cup and add enough milk to make 1 1/3 total cups. Stir, then let stand for 5 minutes before using. Line two 12-cup muffin tins with paper liners; this recipe makes about 32 cupcakes, so if you only have two tins like me, you’ll need to let one cool and re-line it for your last batch. In a mixing bowl, beat shortening and sugar together until creamy. Add vanilla and beat until combined, then add egg whites, one at a time, beating well after each addition. Add flour mixture and sour milk alternatively, starting and ending with the flour, beating until just combined after each addition. Using a 2-inch cookie scoop, scoop batter into prepared tins, filling no more than half-full. Bake for 18-20 minutes, until tops are light golden and a cake tester inserted in the middle of a few cupcakes comes out clean. Cool on a wire rack before filling and frosting. For the filling: in a mixing bowl, beat butter for about 1 minute. Add raspberry jam; mixture will look clumpy, but that’s fine. Scrape down the sides of your bowl, then add powdered sugar and beat on low speed until all of the sugar is fully incorporated into the butter/jam mixture; this will take a few minutes. Scrape down the bowl well and add almond extract, then beat on medium speed for 2-3 minutes. The texture of the filling should be yogurt-like. If your consistency is too runny, add a bit more sifted powdered sugar. Using the small end of a melon baller, scoop out a small amount of each cupcake. Fit a piping bag with a large plain tip and pipe filling into each cupcake. For the frosting: in a mixing bowl, beat butter for about 1 minute, then add salt and beat another minute. Add powdered sugar and beat on low speed until all of the sugar is fully incorporated into the butter; this will take a few minutes. I cover my mixer with a kitchen towel during this process to avoid a powdered sugar mess on my counter. Add vanilla extract and almond extract, beating well to combine for about 2 minutes. Add milk, 1 tablespoon at a time, until frosting reaches a fluffy consistency. Add magenta food coloring to create a bright pink shade. Fit a piping bag with a Wilton 1M tip and pipe frosting onto cupcakes in swirls. My grandma Zella made filled cupcakes years before they became trendy. Perhaps she was a baker ahead of her time – or perhaps she saw a recipe in Woman’s Day magazine and thought, like their food editors, that two desserts combined into one was just a great idea. Usually, her cupcakes used Duncan Hines cake mix and packaged pudding mix; not from scratch, but very tasty nonetheless. 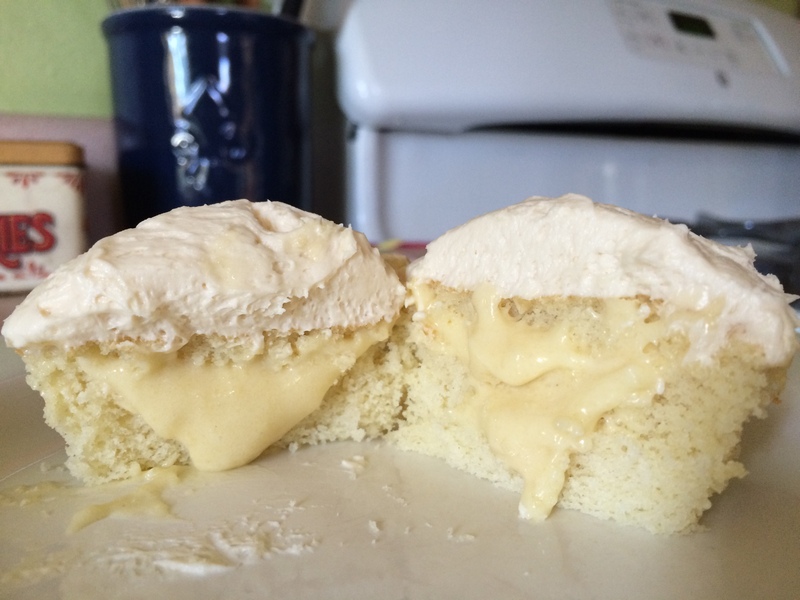 I remember a particularly tasty yellow cupcake that was filled with lemon pudding, then dusted with powdered sugar. Simple, yet delicious. Last week’s Boston Cream Cupcakes left me with a back-up batch of pastry cream that used a slightly different recipe, so today I tossed together these triple vanilla cupcakes – a vanilla cupcake with vanilla pastry cream, topped with vanilla buttercream frosting. If you’re a vanilla fan, you’ll love these cupcakes. Preheat oven to 350. Line cupcake pans with paper liners; my batch made 20 cupcakes. Combine milk and vanilla extract; set aside. In a mixing bowl, combine cake flour, flour, sugar, baking powder, and salt. Beat on medium speed for 2 minutes, then reduce mixer speed to low and add butter a few cubes at a time. Continue to beat for about 2 minutes, until the mixture looks like coarse sand. Add eggs, one at a time, beating well between each. With the mixer running on low, slowly pour in the vanilla milk mixture. Return to medium speed and continue to beat for 2 minutes. Scrape down the sides and bottom of the bowl well. Using a 2-inch cookie scoop, drop scoops of batter into prepared cupcake pans, filling about 1/2 to 2/3 full. Bake for 20-25 minutes, until a cake tester comes out clean. Remove from pans immediately and cool completely on a wire rack. In a mixing bowl, beat butter and salt on medium speed for about 2 minutes. Scrape down the sides of the bowl, then add powdered sugar and beat on low speed until fully incorporated, about 3-4 minutes. Add vanilla extract and beat on medium speed for 2-3 minutes, until fluffy. In a mixer fitted with the whisk attachment, whip pastry cream for 2-3 minutes to lighten. Using a small knife, cut into the center of each cupcake at a 45-degree angle, about 1/8 inch from the edge, all the way around. Remove the core and cut away all but the top 1/4 inch, leaving a small disc of cake. Reserve the scraps for a trifle or other treat. Fill the inside with pastry cream and top with the disc of cake. Using a 1-inch cookie scoop, drop scoops of frosting onto each cupcake and spread with an offset spatula. Store in the refrigerator; bring to room temperature before serving.